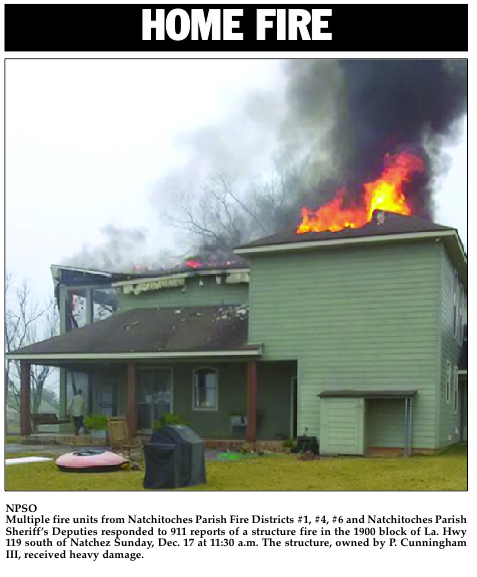 NPSO Multiple fire units from Natchitoches Parish Fire Districts #1, #4, #6 and Natchitoches Parish Sheriff’s Deputies responded to 911 reports of a structure fire in the 1900 block of La. Hwy 119 south of Natchez Sunday, Dec. 17 at 11:30 a.m. The structure, owned by P. Cunningham III, received heavy damage.